Bev Tunney and Amy Schein have been best friends for years; now, at thirty, they’re at a crossroads. Bev is a Midwestern striver still mourning a years-old romantic catastrophe. Amy is an East Coast princess whose luck and charm have too long allowed her to cruise through life. Bev is stuck in circumstances that would have barely passed for bohemian in her mid-twenties: temping, living with roommates, drowning in student-loan debt. Amy is still riding the tailwinds of her early success, but her habit of burning bridges is finally catching up to her. And now Bev is pregnant. 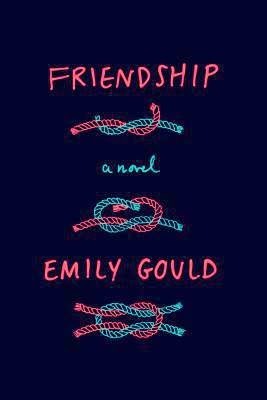 As Bev and Amy are dragged, kicking and screaming, into real adulthood, they have to face the possibility that growing up might mean growing apart. I love books like Friendship, so you've piqued my interest! Thanks for sharing!! You always seem to find ones I've never heard of. It's fantastic! Thanks for sharing! Oh, I've never heard of this one. Friendship books are great! Thanks for sharing! You always have such good picks I wouldn't normally choose! Love it. Looks great! Thanks for the introduction. Sounds like the two may have big problems. I hadn't hear of this one! Thank you for bringing it to my attention! I haven't heard of this book before, but it looks really good! I love how you always find interesting books, this one is going on my wish list! Love this. As someone in her late twenties, I'm approaching this sort of change, so the shifting life circumstances of these characters resonate with me a lot. Thanks for sharing! Love that cover and the premise! Thanks for sharing! I'd love to read this one! Looks good. Potentially emotional. Hope you get to enjoy it! wow, this looks interesting! I'll check it out! Thanks! This is a great forum! Thought we'd add some Canadian content! This one sounds like one I'd really like! And I love the cover as well. Thanks for sharing! Nice pick, Jill! I've not heard of this book before but it sounds good. Just entered to put my blog up there on the list!